Managing Your Infield Soil is a Science. An infield skin can be the source of unlimited frustration for a professional groundskeeper. However, identifying the composition of the infield mix will allow any groundskeeper to more accurately predict how the infield skin will perform in less than ideal weather. Managing the skinned portion of an infield is a science — not guesswork. For this reason, you must know your infield soil composition before taking any action to amend it. Soil testing provides quantitative data that helps to identify the shortcomings of an infield mix. After interpreting your test results, you will be able to make an educated decision about the amendment material to choose. Infield soil tests are a diagnostic tool that many soil testing facilities can perform, but very few can interpret what those results mean in terms of playability on an infield. Choose a soil testing company that understands how the composition of an infield soil affects game day performance. Beacon Athletics has over 10 years experience of infield soil test interpretation and analysis. Our team of soil scientists and a former Major League groundskeeper work with one of the top soil testing firms in the country to be sure you get accurate testing and analysis. Just follow the protocol below to harvest your sample and send it in for testing. 1. Randomly choose 8 to 12 locations around the infield skin that you will pull samples from. This is done to assemble a good representative sample of the skin area. 2. If your infield has a topdressing material on it, scrape or sweep it away completely from the areas you are about to sample to prevent contamination. 3. Find a box or storage container to compile all of your samples. Then, using a small shovel, dig into the infield soil. Collect a 3″ x 3″ sample from each location, no deeper than 3 inches, and toss them into the box. 4. Once you have collected all of your samples in the box, pulverize the soil as much as possible and mix all of the samples together. Use a quart sized zipper storage bag, label the bag in a way that you will remember from which field or complex the samples were taken. Fill the zipper bag almost full and seal it. 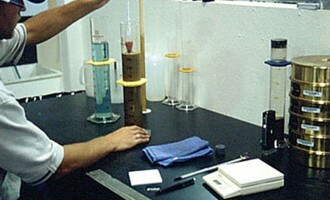 Your sample is now ready to be sent to your soil testing lab for testing and analysis. Remember, Beacon Athletics can conduct your infield soil test and analysis. 5. Normally, you should expect to see results from your test in about 7 to 10 days. 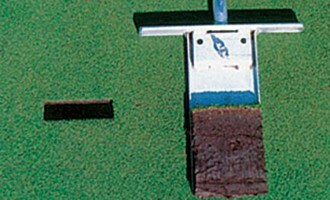 If your soil lab does not analyze results, we can help. Call Beacon Athletics and send us your test results and we’ll analyze your results for you.